Born in 1940, Rick Nelson appeared with his parents in their 1950s TV show, "The Adventures Of Ozzie And Harriet." His recording career began in 1957 and the following year he formed his own band, which included James Burton, who would later become a fixed member of Elvis's band. His soft version of rock'n'roll and clean ballads left him without hits after the early 1960s. 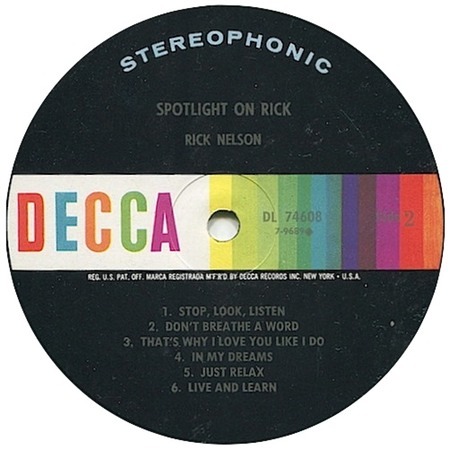 During this time, he released his album, "Spotlight On Rick" (Decca DL 4608), which included the track, "Stop, Look And Listen." Despite his lack of success, he continued recording, forming a new group called "The Stone Canyon Band," but was disappointed by the reception to his new style when he performed in Madison Square Garden in 1971. As a reaction, he wrote and released "Garden Party" in the early 1970s, a song that ironically became a million-seller and his last hit. Ricky Nelson died in a plane crash on 31 December 1985.